To log in to the website, click on “Log in to see members only content” in the upper right-hand corner. You will be prompted to enter your email address and password. If you don't know your password or forgot it, click on the "forgot your password?" link and follow the on-screen instructions to reset your password. If you are an ASCA member and your email address was not found in the database after attempting to log in, please email support@ascassociation.org. 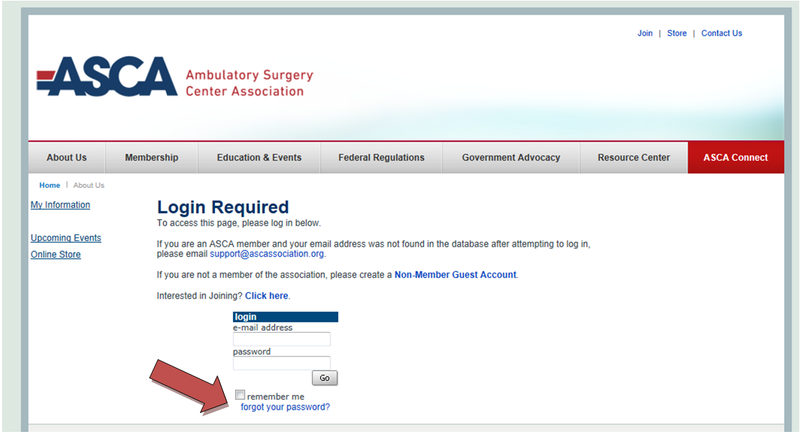 If you are not a member of the association, please create a Non-Member Guest Account. I'm logged in but I still can't see certain content. Certain content on ASCA’s web site is available exclusively to ASCA members, including Medicare information, government advocacy tools and updates, benchmarking surveys and the member directory. Click on the “Log in to see members only content” link in the upper right-hand corner of the web page. Then, click on the "forgot your password?" link and follow the on-screen instructions to reset your password. 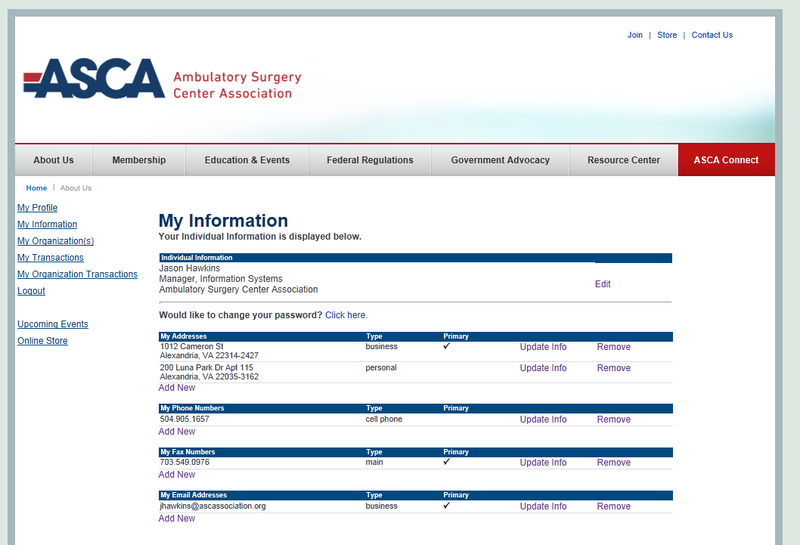 Log in and and navigate to ASCA Connect and choose "My Account" from the "My Profile" navigation drop-down. From there you will see text that says "Would you like to change your password?" Has my login to the Outcomes Monitoring Project and other surveys changed? No, the credentials previously used for the Outcomes Monitoring Project, Financial Benchmarking Survey and ASC Employee Salary and Benefits Survey have not been changed. You will still need the logins originally assigned to you for the surveys. 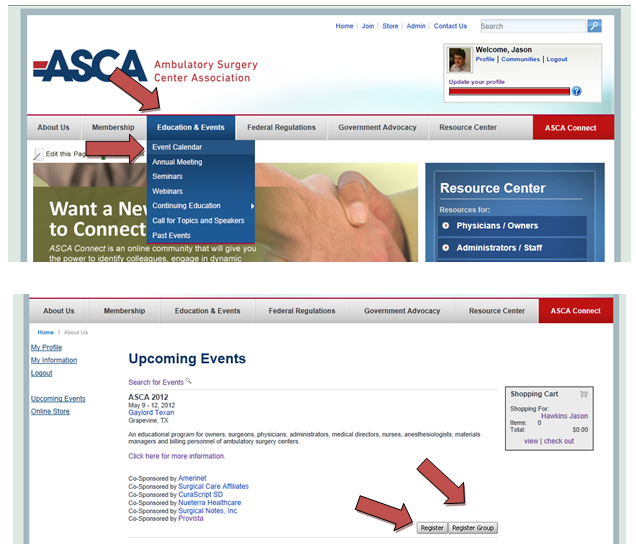 Log in and navigate to ASCA Connect and choose “My Account” from the “My Profile” navigation drop-down. From there you can update your name, suffix, credentials, title, organization affiliation, mailing address, phone number, fax number, and email address. You can register for an event either as part of a group or as an individual. A listing of events that can be registered for is found by navigating on the main site to “Event Calendar” under the “Education & Events” drop-down. You can choose either "Register" or "Register Group." How can I add workshops, optional tours or tickets to my registration? 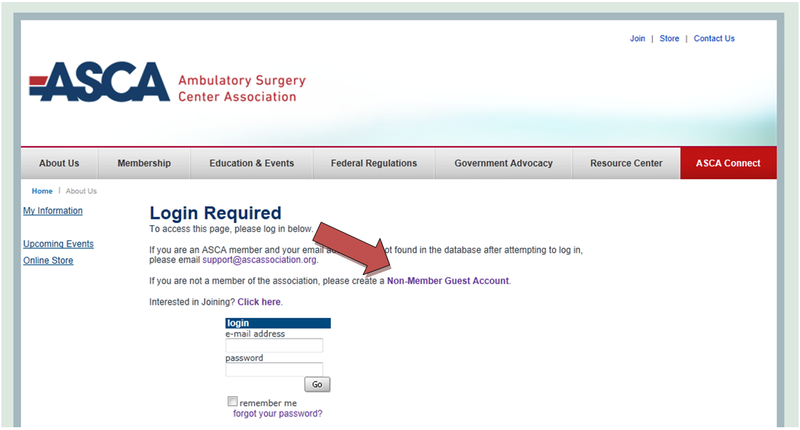 Log in and navigate to ASCA Connect and choose “My Account” from the “My Profile” navigation drop-down. 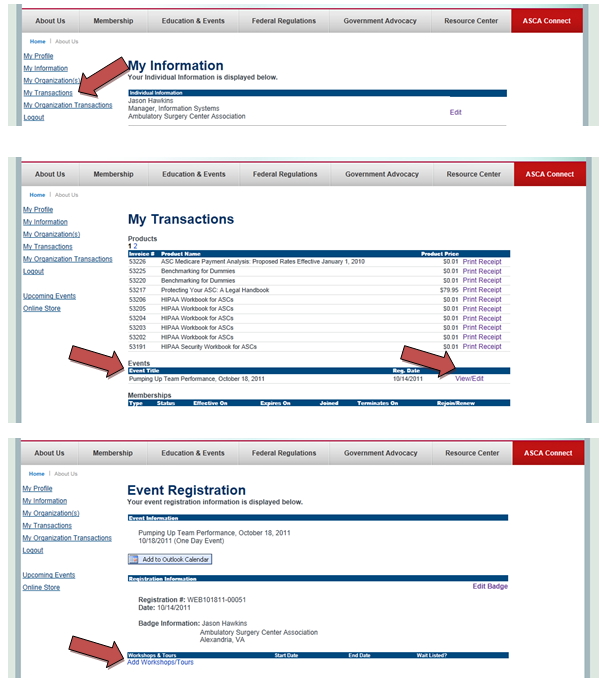 Select "My Transactions" in the left-hand navigation and click "View/Edit" next to the appropriate event listed under the "Events" heading. Once there, select "Add Workshops/Tours" under the heading for "Workshops & Tours." I need a receipt for my publication purchase. Log in and navigate to ASCA Connect and choose “My Account” from the “My Profile” navigation drop-down. Select "My Transactions" in the left-hand navigation and click "Print Receipt" for any personal transactions. You may also find organizational transactions under "My Organization Transactions." 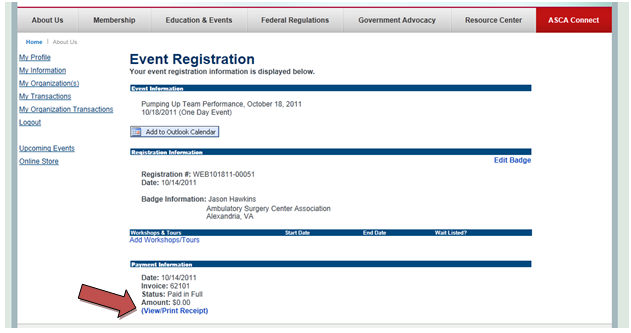 I need a receipt for my event registration. 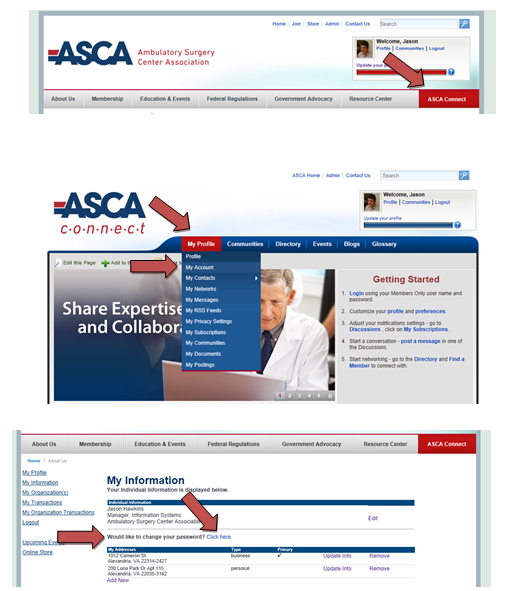 Log in and navigate to ASCA Connect and choose “My Account” from the “My Profile” navigation drop-down. Select "My Transactions" in the left-hand navigation and click "View/Edit" next to the appropriate event listed under the "Events" heading. Once on the Event Registration page for the particular event, the user can click ("View/Print Receipt") under the "Payment Information" heading.